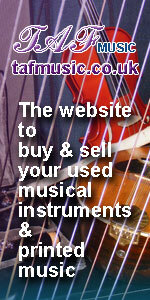 The TAF Music Gifts on-line shop is a family run, Herefordshire-based business which is an off-shoot of the TAF Music website. The idea of a gift shop grew out of many years of searching for musically related gifts for our children, their friends in various bands, orchestras and music groups as well as gifts for their music teachers and tutors. Many of the items that are sold through the TAF Music gifts website are either completely hand-made in Britain or assembled and finished in Britain using components from various places. The TAF Music Gifts jewellery collection, comprising bracelets, rings, earrings and necklaces, is almost completely hand-crafted and aims to provide quality jewellery at a reasonable price. We carefully source and test the raw materials to develop a stunning piece of music related jewellery. We use fine quality Swarovski crystal beads in the jewellery wherever possible to add that extra sparkle and shine. Those hard to find 2B pencils that every orchestral player needs (and always seem to be sold out at the local stationers) together with decorated mechanical pencils, key rings and even the occasional music stand light are all available on-line through the shop. If you have any suggestions of items you would like us to provide through the online shop, or if you have any (new) music related gifts that you would like to sell through this website, please do not hesitate to get in touch with us through the contact us page. giving greater exposure to musical advertisements!